I decided to try that crafting method where you print a design onto freezer paper and then transfer the design to another surface. I will admit, I tried a few different things and some of them did not turn out. I decided to start on a high note. This was the pile of base painting I started out with. Three different projects! For this project I started off by base painting 2 mason jars and a glass candle holder with a sort of baby pink paint. I let them dry fully before moving on to the next step, which I forgot to photograph. I taped freezer paper to a piece of printer paper and cut to size. I had to figure out which way the paper fed into my printer as well. Make sure to have the shiny side of the freezer paper facing up lol. I almost made that mistake! Now I just had to choose a design. There were so many when I searched Google that it was hard to decide! I settled on 3 different images and started to print, fingers crossed that it would work this time. NOTE: The images I chose were already “mirror ” images, meaning when I transferred them to my surfaces they didn’t end up backwards! If your image isn’t already a mirror image, you can set your printer up to print a mirror image in the settings. I started out with the candle holder and holy crap, it worked! It was sort of muted, but so was the image I chose. I wanted a faded, vintage sort of bottle look. NOTE 2: When the paper comes out of the printer, the ink is wet. Ask me how I know lol. Handle with care so you don’t end up covered in ink or smudge your image! I did the same thing for the 2 mason jars and let them dry for about an hour. Once fully dry, I applied a few coats of sealer. That helped the image to brighten up a bit too. Then I decided to wrap some twine around the rims of the mason jars, holding it in place with glue from the dreaded glue gun, just to finish them off instead of putting the lids back on. 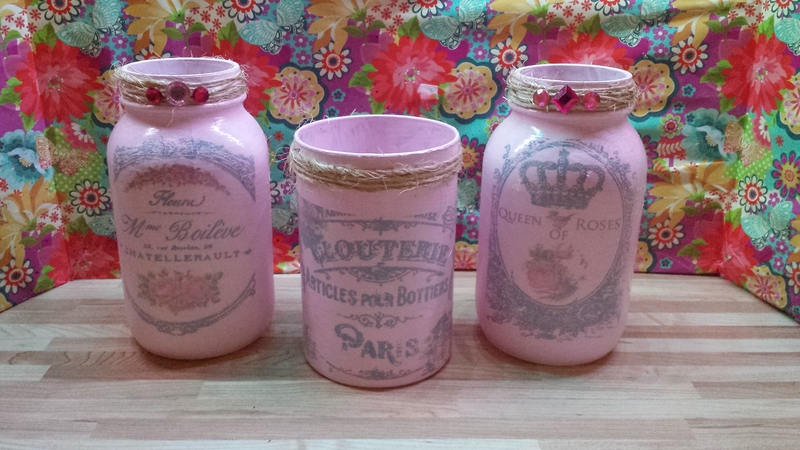 And here is my finished freezer paper transfer jars. More pretty storage for the craft room! 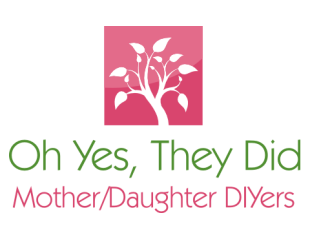 This entry was posted in Crafts, Decor, gifts, informative, The Craft Room and tagged craft room decor, freezer paper transfer, postaday, pretty storage, storage jars. Bookmark the permalink. That looks brilliant! How do you actually make it transfer? Thanks. Because it’s printed on the freezer paper the ink is wet and just sits on the paper. In order to transfer it, I just had to position it and rub the back of the paper until the ink was all on the jars. It’s sort of the same idea as those temporary tattoos for kids. I’m giving this a go! I hope you do. It was fun!